In celebration of Attachment Parenting International’s 20th Anniversary, we are pleased to present two series of interviews with API Leaders. 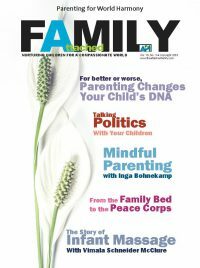 This article, the first in the “Generation AP” series, recognizes today’s second-generation Attachment Parenting parents. Attachment Parenting is no one-size-fits-all child-rearing formula: It’s about having a warm, joyful relationship with our children built on the foundation of sensitive responsiveness, empathy and trust. The need for a secure attachment is instinctually programmed into each of us so that we’re continually striving toward it, whether we recognize it or not. Every parent is on their own parenting journey, and all parents are doing the best they can with the knowledge and support available. Still, it’s reassuring to know that we’re not the first generation to practice Attachment Parenting (AP). At the time of this interview, Patricia Mackie of Naperville, Illinois, USA, was just a few weeks away from her third baby’s birth. Patricia is a passionate API volunteer and devotes time to several API projects, including Naperville API in Illinois as an API Leader, API Professionals Program, API Editorial Review Board, API Warmline and Journal of Attachment Parenting. In addition, Patricia is a marriage and family therapist, author of the “Three’s a Crowd” course for expectant and new parents, and founder of the Connecting 1 Day at a Time program for couples with children. RITA: Thank you, Patricia, for squeezing me into your busy schedule, especially with baby coming soon. Let’s start by reviewing how your parents practiced AP. PATRICIA: My parents grew into it. They practiced more Attachment Parenting with me than they did with my older sister.For the most part, they followed all of the principles. We were very involved as a family in cooking and growing our own food. I have great pictures of my dad with me on his back. Both of my parents wore me as a baby, more so when we were out and about than when we were at home. They were also sensitive to us during sleep. Mom said I would not sleep in her arms. She would rock and nurse me for hours waiting for me to sleep. Then, she put me in the bassinet and I was out. My sister and I had our own beds, but my parents’ bed was always open for my sister and me. My mom tried to do as much positive discipline as she could, but she was really young when she had children and didn’t have much support. She went through trial and error as all parents do. RITA: It sounds like you had a family-centered lifestyle growing up. Please share a couple of your favorite memories. PATRICIA: I grew up in Alaska, and Mom’s favorite thing to do was to go to this little pull-off on the road, Beluga Point. Sometimes when we were having a hard day or a really good day, or just because, we would go for a drive, get Subway sandwiches, go to Beluga Point, and sit and eat and watch the ocean and the mountain sheep. Sometimes Mom would go with both me and my sister, sometimes it was just me and Mom, but it was a connection point for us. When I was 4, my parents bought a cabin, and we would go up there every weekend. It was our family time—time with everybody together, to play together, to work together, another connection time. RITA: It’s important for families to spend time together in a positive environment. How did your parents react when emotions were not so positive? How did they respond to strong emotions in you, such as anger? PATRICIA: It was an area of growth for my parents, but my mom had a way of knowing what to do. When I was 7, I ran my bike through a stop sign, and there as a police officer who saw me. I think I scared him as much as he scared me, but he apparently wanted to make an impression and turned on his lights and yelled at me to slow down and watch what I was doing. He scared the daylights out of me! I came home really upset. Mom knew something was going on but didn’t know what, and I wasn’t talking. So she sat down with me and encouraged me to talk about it. When I experienced major emotions, I would just shut down. My mom would sit with me for hours and wait for me to talk. RITA: Is this what influenced your career in counseling? PATRICIA: Growing up, my parents thought I’d end of in one of two careers: either a lawyer, because I was really good at arguing, or a therapist. At school, there was this little hill where I liked to sit. And my friends would come and sit and talk with me when they needed someone to talk to. It felt so good to talk and be listened to. I grew up learning that when you have a hard time, you talk about it. It’s so simple and yet the very last thing we think about. When I was a teenager, I had a negative view on life and was difficult to be around. But every day, my mom and I would have afternoon tea. I didn’t have to drink the tea or eat cookies, but I couldn’t get up from the table until I talked about what was going on. If I had a rough day, she helped me to look at the positives and to stop dwelling on the negatives. That was her way of teaching me without making me feel worse. My mom also encouraged me in a way that she didn’t realize My sister and I had a very hard relationship growing up. We don’t see the world through the same eyes. Mom would threaten us, but never follow through, for us to either stop fighting or she would take us to therapy. I always wanted to go to therapy, because then my sister and I could learn to talk to one another. Another big influence was my grandmother. She died when I was 12, and this really affected me. We had a very special relationship. It was from her that I grew up with high values for marriage and that you don’t give up on marriage. RITA: Did you ever feel that the way your parents were raising you was different than how your peers were raised? PATRICIA: I knew when I was very young that I was very lucky to have the parents I have, though I didn’t know why. I would go to sleepovers at friends’ houses and would be shocked to hear their parents fighting in the next room or when one of the parents would ignore the other parent. RITA: Hmm, that’s interesting. So did you find it natural to practice AP with your own children? PATRICIA: I was practicing Attachment Parenting before I knew what it was. To me, there was no other choice. I remember one visit to the doctor when he asked me if I was going to breastfeed. I said, “Yeah.” And he put down his notebook, turned to me and said that in all his years of practice, not one time did a mother said “yes” that they would breastfeed without a second thought. They all said they would try. However, positive discipline has been a challenge. My mom did some spanking when I was young, and she made threats. My mom didn’t get into the groove with positive discipline until I was a teen. All the things that make my daughter a wonderful person also make it hard during discipline, just like I was for my mom. That’s the hardest part of raising her: She’s me. My son is very different: very laid back, go-with-the-flow. I thought my daughter was an easy baby, and then my son was born and I realized, oh, she was a high-needs baby. 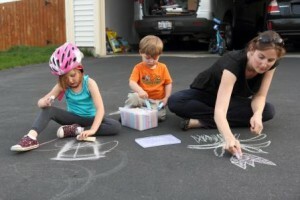 RITA: Many parents are plagued by the desire to be perfect in their parenting. How do you feel about parents who struggle with AP? PATRICIA: It’s natural to struggle. I don’t think that everything in parenting comes naturally. I think of my sister. She doesn’t have that natural instinct to pick up her babies and snuggle with them. Some people don’t. We all struggle at some points. RITA: When did you find API and learn that what you’re doing is AP? PATRICIA: When I needed support because my daughter wouldn’t sleep, I would go online and search the mommy boards looking for answers. I was reading all the horrible stuff that people do to their kids and was thinking, I need to find people who think like I do. RITA: Now that you have a name for your parenting approach, how do your parents feel about Attachment Parenting? PATRICIA: Because my sister lives closer to my parents than I do, and she does not practice Attachment Parenting, they are more familiar now with her parenting style than mine. But they are very supportive of me, and we are able to talk about our differences in parenting views. RITA: And what about your husband—did he come from an AP family, too? PATRICIA: No, at all. He was an only child, and he had no experience with children or babies whatsoever. But he has always been very much okay with what I do. It’s hard with his parents. Over the years, though, they’ve grown very curious about Attachment Parenting. They’ve accepted that’s the way we do things, because clearly it’s working. RITA: Thank you, Patricia, for your insights. One final question: What is a way that others can see the effects of Attachment Parenting? PATRICIA: All of my daughter’s preschool teachers say they can’t believe how empathic she is. She’s not trying to please anyone. She’s just aware of everyone’s emotions and readily goes to comfort an upset child.